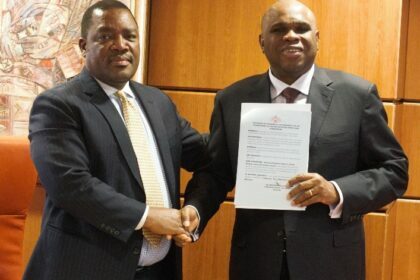 Cairo, 06 March 2019: – The Kingdom of Eswatini today in Cairo deposited the instrument of its accession to the 1993 Agreement for the Establishment of the African Export-Import Bank (Afreximbank), making it the 51st African country to become a participating or shareholder state of the continental trade finance institution. The instrument, signed on 25 February by Prime Minister Ambrose Mandvulo Dlamini of Eswatini, was handed over to Prof. Benedict Oramah, President of Afreximbank, by Promise Msibi, Permanent Representative of Eswatini to the African Union and the country’s Ambassador to Ethiopia, during a ceremony at the Bank’s headquarters building. Speaking during the ceremony, Prof. Benedict Oramah, expressed the Bank’s appreciation for the “milestone occasion”, which he described as the result of years of ongoing and persistent engagement between the Bank and Eswatini. In anticipation of the accession of the Kingdom of Eswatini, the Bank was already working with the Ministry of Finance and Ministry of Industry, Commerce and Trade of Eswatini to identify priority sectors and transactions which it could support, said President Oramah. They included support for acquisition of wagons for Eswatini Railway, equipment import facility for Swazi Mobile and support for the planned export processing zone. President Oramah said that the Bank would shortly be sending a business development mission to Mbabane help move forward the transactions that had been identified. Also speaking, Mr. Msibi expressed regret that Eswatini was only just joining the Bank and expressed the country’s commitment to supporting the work of the Bank. He commended Afreximbank for its effort to introduce a Pan-African Payment and Settlement Platform, said that it would greatly improve the quality of life of Africans, especially in the context of the implementation of the African Continental Free Trade Agreement (AfCFTA). He noted that Eswatini was positioning itself to host secretariat of the AfCFTA and said that the payment platform would facilitate the smooth takeoff of the secretariat. He urged Afreximbank to move toward a quick implementation of the programme that had been identified in Eswatini. Equatorial Guinea became Afreximbank’s 50th participating or shareholder state with the country’s signing of the Instrument of Accession to the Establishment Agreement in Malabo on 6 June 2018. Countries currently on the list of Afreximbank participating and shareholding states include Angola, Benin, Botswana, Burkina Faso, Burundi, Cameroon, Cape Verde, Chad, Central Africa Republic, Comoros, Côte d’Ivoire, Democratic Republic of Congo, Djibouti, Egypt, Equatorial Guinea, Eritrea, Ethiopia, Gabon, Gambia, Ghana, Guinea, Guinea Bissau, Kenya, and Lesotho. Accompanying Mr. Msibi to the ceremony was Phathizwe Malambe, First Secretary (Political at the Embassy of Eswatini in Addis Ababa.